In the United States and Canada, a cookie is a small, flat-baked treat, containing milk, flour, eggs, and sugar, etc. In most English-speaking countries outside North America, the most common word for this is biscuit; in many regions both terms are used, while in others the two words have different meanings—a cookie is a plain bun in Scotland, while in the United States a biscuit is a kind of quick bread similar to a scone. Its name derives from the Dutch word koekje or (informal) koekie which means little cake, and arrived in the English language through the Dutch in North America. Cookies are most commonly baked until crisp or just long enough that they remain soft, but some kinds of cookies are not baked at all. Cookies are made in a wide variety of styles, using an array of ingredients including sugars, spices, chocolate, butter, peanut butter, nuts or dried fruits. The softness of the cookie may depend on how long it is baked. Cookie-like hard wafers have existed for as long as baking is documented, in part because they deal with travel very well, but they were usually not sweet enough to be considered cookies, by modern standards. * Refrigerator cookies are made from a stiff dough that is refrigerated to become even stiffer. The dough is typically shaped into cylinders which are sliced into round cookies before baking. * Molded cookies are also made from a stiffer dough that is molded into balls or cookie shapes by hand before baking. 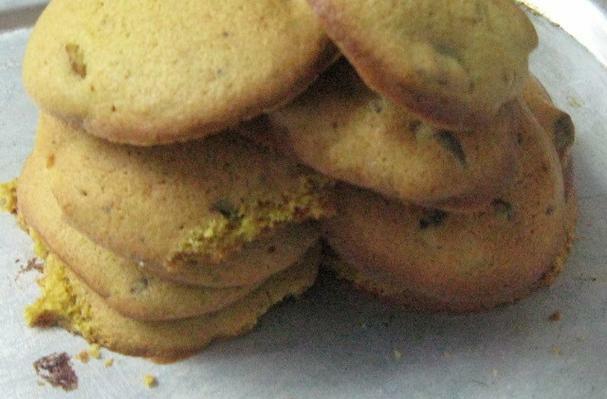 Snickerdoodles and peanut butter cookies are examples of molded cookies. * Rolled cookies are made from a stiffer dough that is rolled out and cut into shapes with a cookie cutter. Gingerbread men are an example. * Pressed cookies are made from a soft dough that is extruded from a cookie press into various decorative shapes before baking. Spritzgebäck are an example of a pressed cookie. * Bar cookies consist of batter or other ingredients that are poured or pressed into a pan (sometimes in multiple layers), and cut into cookie-sized pieces after baking. Brownies are an example of a batter-type bar cookie, while Rice Krispie treats are a bar cookie that doesn't require baking, perhaps similar to a cereal bar. In British English, bar cookies are known as "tray bakes". * Sandwich cookies are rolled or pressed cookies that are assembled as a sandwich with a sweet filling. Fillings may be with marshmallow, jam, or icing. The Oreo cookie, made of two chocolate cookies with a vanilla icing filling is an example. * Cookies also may be decorated with an icing, especially chocolate, and closely resemble a type of confectionery. Choosing: Choose a cookie whose flavor sparks your interest. Buying: Cookies should be made in your home not purchased somewhere else. The only exceptions are the cookies sold at farmer's markets that were made in someone elses home. Store bought cookies are full of bad things. Cookies can range in size, shape and flavor, however every region and country has cookies that features the flavors and texture that are specific to it's culture and people. History: Cookies appear to have their origins in 7th century AD Persia, shortly after the use of sugar became relatively common in the region. They spread to Europe through the Muslim conquest of Spain. By the 14th century, they were common in all levels of society, throughout Europe, from royal cuisine to street vendors. Cookies came to America in the early English settlement (the 1600s), although the name "koekje" arrived with the Dutch. This became Anglicized to "cookie" or cooky. Among the popular early American cookies were the macaroon, gingerbread cookies, and of course jumbles of various types. I really like that topic that you posted. It was a really cool read for me.